God said, “I looked for a man among them who would build up the wall and stand before me in the gap on behalf of the land so I would not have to destroy it, but I found no one”(Ezekiel 22:30 NIV). How many times have I heard those words? How many times have they slipped past my lips? But what if we looked at prayer from a different perspective…God’s perspective? What if we viewed prayer as our first course of action rather than a last resort? The vast majority of the emails I receive through my ministry center around marriage problems. Women struggle with husbands who aren’t living up to their expectations: men who work too much and love too little, men who withdraw emotionally and advance sexually, men who initially appear to be Prince Charming but later reveal the villain within. The second most common request is in regard to children—both school-age children and adult children out on their own. Listen, I get that. Been there. Still there on many days. Regardless of where your marriage, your children, or your family fall on the continuum of terrific to tolerable to terrible, there is always room for improvement. Prayer can make a bad situation good and a good situation great. One thing we have to remember: Prayer is not a means of gaining control over your husband, to whip him into shape and make him the man you want him to be. Prayer is a means ofrelinquishing control of your husband and asking God to shape him into the man that He wants him to be. Prayer involves turning the finger that points out your man’s faults and folding it along with the others in prayer. Prayer is not a means of getting your children to be exactly what you want them to be, but for them to be exactly what God wants them to be. Prayer is not a means to gain control over any situation in your life, but to relinquish control so that God can do what God needs to do. God is the Master Potter, and He certainly doesn’t need you or me to tell Him how to shape and mold the people that we are praying for. Oh, we’d like to. That’s for sure. But God’s ultimate goal is for each lump of clay to be fashioned according to His design and for His purposes, not ours. “We are the clay, you are the potter,” Isaiah writes, “we are all the work of your hand” (Isaiah 64:8). I am. You are. Whoever you are praying for today is. God shapes and molds. You pray and intercede. James warns about the danger of praying with wrong motives (James 4:3). Check your desire to control at the door of the prayer closet and don’t let it in. Ezekiel gives us a glimpse into the heart of God regarding prayer. Israel had sinned in every possible way, and her people were doomed for destruction. God said, “I looked for a man among them who would build up the wall and stand before me in the gap on behalf of the land so I would not have to destroy it, but I found none” (Ezekiel 22:30). God looked for someone to pray, to intercede, to stand in the gap for Israel, but there was no one. Today God is looking for women who will stand in the gap for their husbands, children, friends, family, and nation. I’m so glad He has found such a woman in you. Dear Lord, today I stand in the gap for __________. I pray for _________’s mind, that You would keep wrong thinking out and usher truthful thinking in. I pray for ________’s eyes, that he/she would turn his/her eyes toward what is good, and away from what is evil. I pray for _______’s ears, that he/she will listen to words and music that glorify You, and turn his/her ears away from words and music that would do his/her soul harm. Has God called you to stand in the gap for someone today? Here are the sixteen landmarks of prayer that I cover in Praying for Your Husband from Head to Toe. You can use these same landmarks to pray for anyone. I am so excited about my latest book that is hot off the press. 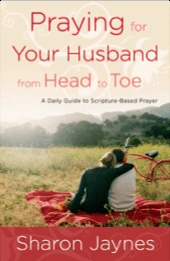 Praying for Your Husband from Head to Toe: A Daily Guide to Scripture-Based Prayer.In it I map out sixteen landmarks to help wives consistently and effectively cover their husbands in prayer from his mind and the thoughts he thinks, to his eyes and the images he sees, all the way down to his feet and the path he takes. The 30-day prayer guide shows women how to pray in ways that are powerful, practical, and life-changing. Not married? This book is a great resource to use to pray for any man in your life…including adult sons, nephews, and that special someone. And if you’re an Apple user, check out the Praying Wives app for 365 prayers to cover your man everyday.